I received a collection of Grandpa Beck’s Games in exchange for this post. All opinions are mine alone. 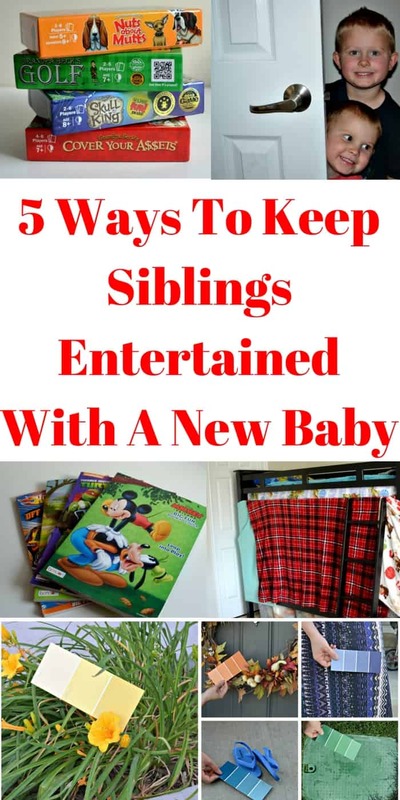 Keeping older siblings entertained (and quiet) with a new baby can be tough. 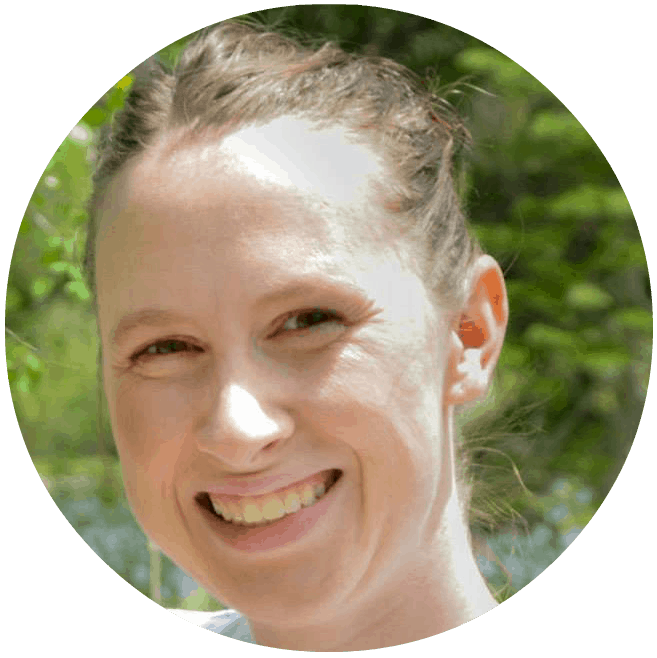 Check out these tips for making the transition a little easier. I feel like I’m all ready for our baby girl to be born. Car seat is bought, crib is set up, hospital bag is packed; we’re ready to go! What I’m not quite sure I’m prepared for is how I’m going to be able to take care of 3 kids when we get home. Thankfully my husband is going to be able to take a couple weeks off work to help make the transition easier but after that who knows what’s going to happen. When we brought little Statham home Rohrl was just 14 months old so he was still relatively quite and took 2-3 naps a day. Now I have a 3 and 4 year old who are very active and very loud. To prepare for the times when I’m needing to take care of their baby sister and have a little quiet time I’ve come up with 5 things I can have them do that will keep them entertained and (hopefully) quiet. These are also great ideas for when you’re not feeling great or stuck on bed rest. Build a fort. This takes a little bit of time initially on my part but is so worth it. 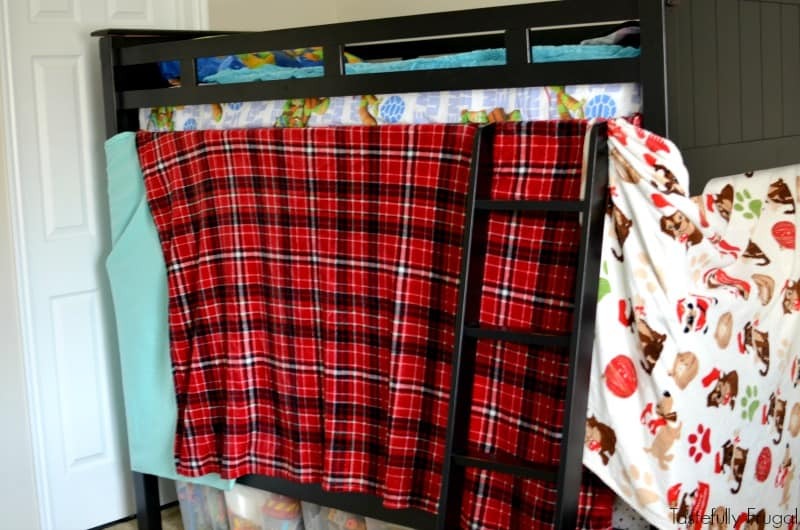 My boys love when I build them forts in the living room or on the bottom bunk of their beds. 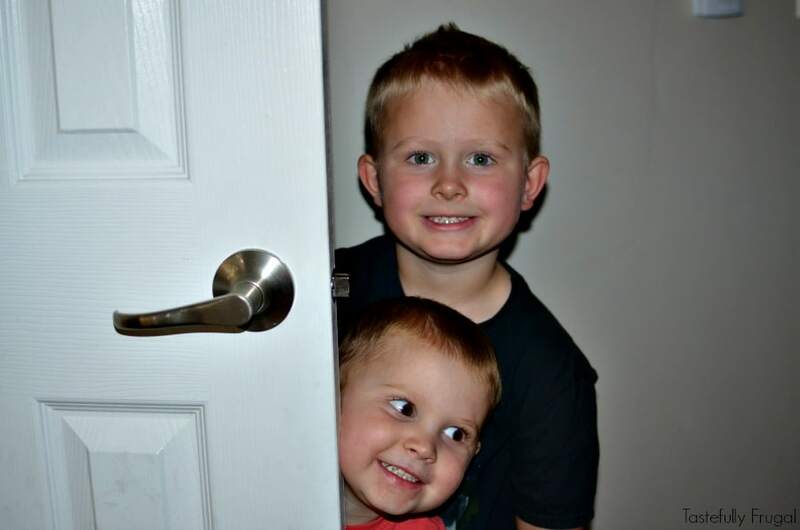 They love to get their toys, swords or tablets inside and live in their own little world. It also gives them a place to call their own. We’ve gotten lots of new things for baby girl but this is one place that is all theirs. Play “hide and guess where I am”. I’ve played this several times during my pregnancy when I’ve had a particularly rough day and need to rest on the couch or in bed. It’s just like hide and go seek except I don’t have to get up and find them. I just guess where they are from where I’m at. This game is great for little ones who haven’t quite mastered the concept of hide and go seek yet. Coloring books. This one is pretty self explanatory. 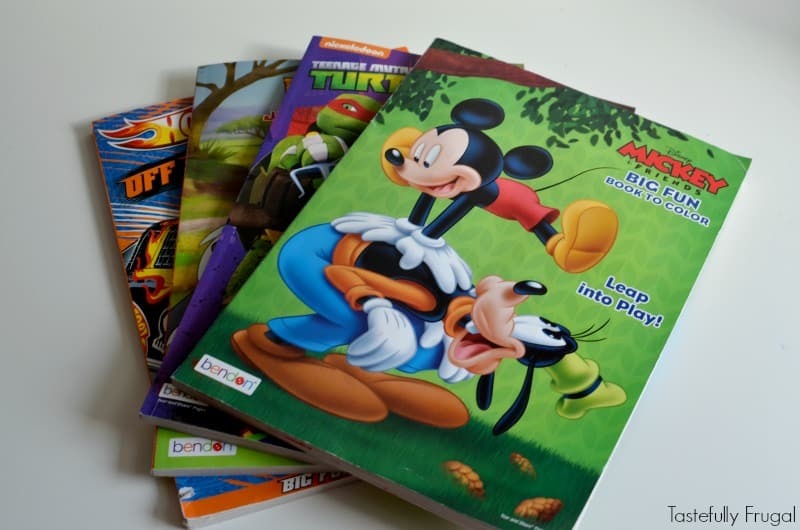 My boys love when they get a new coloring book; they check out all the pages, tell me stories about the characters and have a blast coloring and doing activities. You can pick up coloring books just about anywhere but my favorite place is the dollar store. Pick up a few new boxes of crayons or colored pencils too to sweeten the deal. Scavenger Hunts. 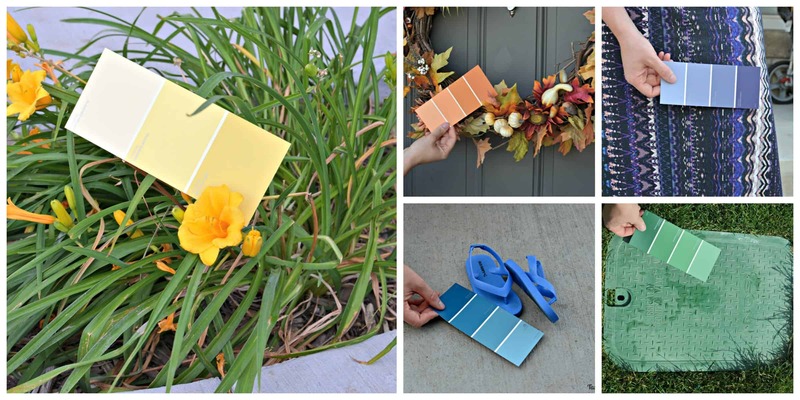 Whether you make up your own or use a free printable version (like this Halloween one or this nature one) having your kids explore the house, or the yard, to find things is a great way to get a good 10-15 minutes of quite time. The best part is it gets them up and moving too which could equal nap times for everyone later in the day. Fun Games. My boys have become huge fans of card and board games. They were so excited when we got this collection of Grandpa Beck’s Games in the mail. 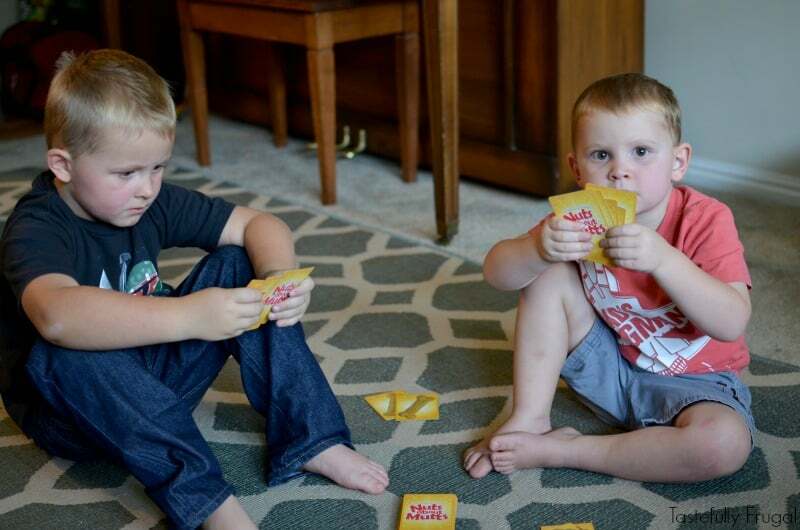 If you haven’t heard of Grandpa Beck’s Games they are a fun card games focused on getting families laughing and playing together. Grandpa Beck himself came up with the games as he played with his children and grandchildren around their kitchen table. Nuts About Mutts was by far my boys’ favorite. They call it “Dog Uno” because the rules are similar to the classic Uno game but a lot more twists and turns. Cover Your A$$ets was my husband’s favorite. Any game that involves money and building your assets he is a fan of. Think a card version of Monopoly. Skull King was my favorite because it involves thinking ahead and planning your next three or four moves. It’s a pirate version of checkers or chess (but is way more fun to play). Golf was another favorite of my oldest. He has been working hard on learning his numbers, addition and subtraction so he loves showing off his newly learned skills. 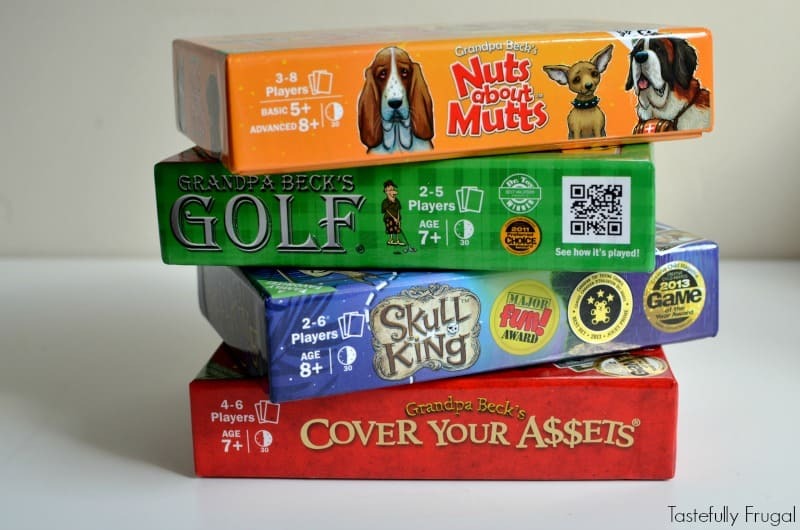 If you’re looking for a collection of games the whole family will enjoy definitely give Grandpa Beck’s a try; it’s a great way to spend quality family time while being able to sit and relax. How have you found balance when it comes to keeping your older kids happy and entertained while taking care of a new baby? How do you do it? And if you are bringing a little one home soon be sure to check out Grandpa Beck’s Games and have one or two (or all four) in your game closet. You, and your kids, will be happy you did!